I must say this is one of the most interesting projects I've taken on. 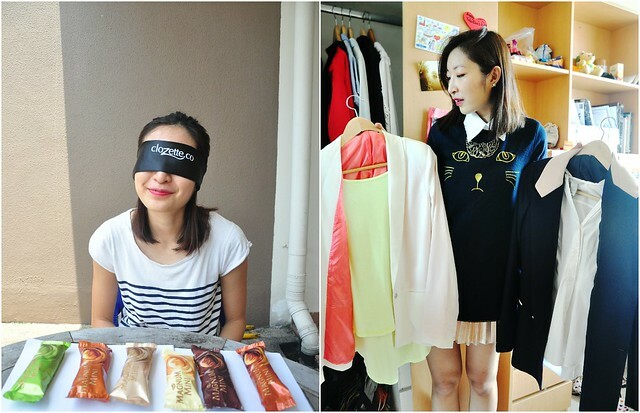 The Task: Take a blind test of 6 Magnum Mini flavors, make a guess, and then come up with an outfit for each flavor that I've tasted! The first flavour I tried was almond, which was the easiest to guess due to its distinctive crunchy almond flakes rolled in Belgian milk chocolate coating. I very much enjoyed the texture of the crunchy almonds paired with the smooth vanilla ice-cream core, and the almonds lent a delicious nutty smell to the ice-cream. 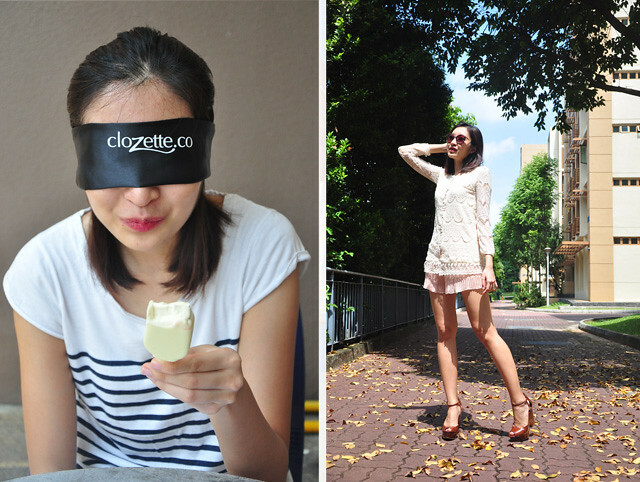 Its petite size makes it the perfect after-work mini indulgence! I wanted to convey a luxe look for an equally luxurious flavour and I've paired an American Apparel bustier leotard with a gold pleat skirt and contrast lapel blazer. This is my favourite amongst all the other flavours because it has a very natural earthy, organic taste to it and is not too over-poweringly sweet. The pistachio ice cream is perfectly balanced with a Belgian dark chocolate layer that encrusts the ice-cream, making it the ultimate double indulgence. When you bite into the dark chocolate coating, the savouriness of the pistachio goes really well with the dark chocolate and it just reminds me of a beautiful day out on the beach. Hopefully in the Maldives. In an ode to Pistachio, I have decided to wear a more casual and resort themed outfit with hawaii prints. At the end of the day, I am still a firm believer in originals. The classic is the first flavour released by Magnum - just a simple coating of dark Belgian chocolate with silky vanilla bean ice-cream. This was the flavour that sparked off all the others - and therefore a legacy and an icon amongst all chocolate coated ice-cream sticks. The vanilla bean ice-cream was really creamy and smooth - you can really see specks of vanilla bean inside, and is definitely a better choice compared to conventional "vanilla essence flavoured" ice-cream. And as an ode to the classic, I wore a black and white monochrome outfit with a slight retro reference. I am especially in love with this vintage high-collared blouse that drapes down the body in froths of chiffon - I call it the tissue blouse. Paired with a sequin wrap skirt and retro circular shades. Ahhhh white chocolate. This can be compared to as the comparable girlfriend to the Classic, with its sweet Belgian white chocolate coating wrapping the silky vanilla bean ice-cream core. The White has a very harmonious flavour, as the white chocolate perfectly blends with the smooth vanilla ice-cream as it slow melts inside your mouth. I decided that a ladylike, elegant look was best for the White and have paired my lace cardigan with a pair of cream colored pleated skorts. The White would be my perfect indulgence on a hot summer day! Gianduia is yet another new flavour released by Magnum. It tastes really smooth with a coating of nougat milk chocolate sauce and vanilla ice-cream laced with generous swirls of hazelnut. I especially enjoyed the nougat chocolate coating, which gives you the fragrance of hazelnuts on first bite. The hazelnut swirls are blended perfectly with the vanilla ice-cream, adding a tinge of sweet, nutty taste to the plain vanilla. For this creative burst of flavour, I have decided that a colorful look was the best in this case, paired with mismatched bracelets and assorted rings. Worn here with my favourite mint green Zara knit sweater, layered over a chiffon collared blouse and a Zara hot pink pleat skirt. The moment you bite into the crunchy double chocolate coating, caramel sauce just oozes out and is mixed with the rich vanilla ice-cream. This ice-cream is one of those things that I wouldn't want to share with anyone - I would sink myself onto soft sofa cushions and slowly savour the ice-cream by myself undisturbed. Such pleasure. For me, this flavour is the perfect after-school pick me up, which is why I conjured up a schoolgirl inspired look for this flavour. Meow~ please feed this kitty more delicious creamy Magnums! I really love Magnum's new range of Magnum Minis. At just 180 calories per stick, Magnum Minis will allow me to indulge in sweet treats guilt-free. At the end of a tiring day of work, or even as a midday stress relieve treat, Magnum really brings me pleasure and makes me feel better. There must be some magic in those crunchy Belgian chocolate and rich vanilla bean ice-cream! These Magnum Minis are now my favourite go-to treat to reward myself and indulge - they're so good I almost feel like I am stealing a moment with my intimate self each time I bite into the Belgian chocolate coating and allows the chocolate to slow melt with the creamy vanilla interior inside my mouth. Like Magnum on their Facebook page here to discover your own secret pleasure. I just found your blog and I am so glad I did! Your blog is so lovely and I love this post! 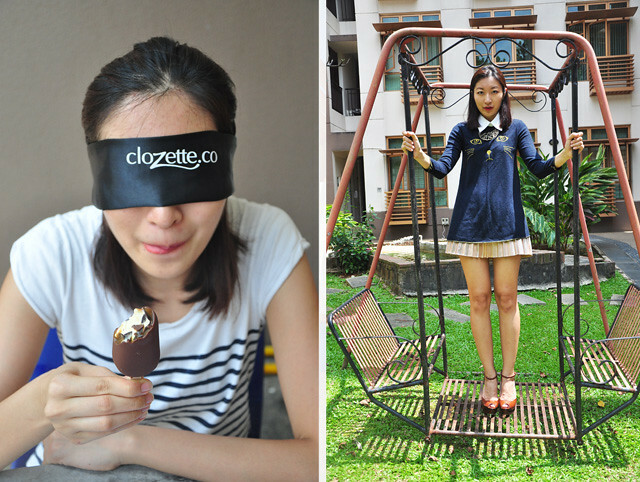 It's such a unique post and I love how you styled each and every ice cream flavor to match your gorgeous outfits! If you had the chance, I would love it if you could check out my blog! Thank you hueys for the encouragement! I really appreciate it! Wow haha that's the first time someone told me that! I got a good laugh from it.